Water moves on the surface of Earth, in the atmosphere, and under the ground. This movement is called the water cycle. The water cycle can happen very quickly or very slowly, even millions of years. The water cycle includes the liquid, vapor and ice states of water. For example, it can start with the process of the Evaporation come from the Oceans and goes into the Atmosphere.In the Atmosphere the vapor condenses into a cloud. From the cloud we get rain, snow, and ice. The rain or snow sits on the surface of the ground and becomes a lake. Or the rain runs down a mountain to become a river that goes back to the Ocean so the cycle repeats. Water cycle for kids poster. Beaver Valley Power Station in Pennsylvania. Hot water evaporating inside the towers creates steam that rises from large cooling towers. Evaporation is the process by which water changes from a liquid to a gas or vapor. Evaporation is the primary pathway that water moves from the liquid state back into the water cycle as atmospheric water vapor. Studies have shown that the oceans, seas, lakes, and rivers provide nearly 90 percent of the moisture in the atmosphere via evaporation, with the remaining 10 percent being contributed by plant transpiration. A valley in New Zealand in early morning with fog layer in the valley bottom. Heat from the sun or a dry wind will dissipate the fog soon. Evaporation from the oceans is the primary mechanism supporting the surface-to-atmosphere portion of the water cycle. After all, the large surface area of the oceans (over 70 percent of the Earth's surface is covered by the oceans) provides the opportunity for large-scale evaporation to occur. On a global scale, the amount of water evaporating is about the same as the amount of water delivered to the Earth as precipitation. This does vary geographically, though. Evaporation is more prevalent over the oceans than precipitation, while over the land, precipitation routinely exceeds evaporation. Most of the water that evaporates from the oceans falls back into the oceans as precipitation. Only about 10 percent of the water evaporated from the oceans is transported over land and falls as precipitation. Once evaporated, a water molecule spends about 10 days in the air. The process of evaporation is so great that without precipitation runoff, and groundwater discharge from aquifers, oceans would become nearly empty. Condensation is the process by which water vapor in the air is changed into liquid water. 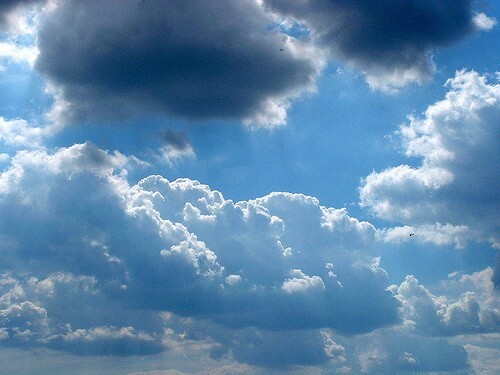 Condensation is crucial to the water cycle because it is responsible for the formation of clouds. 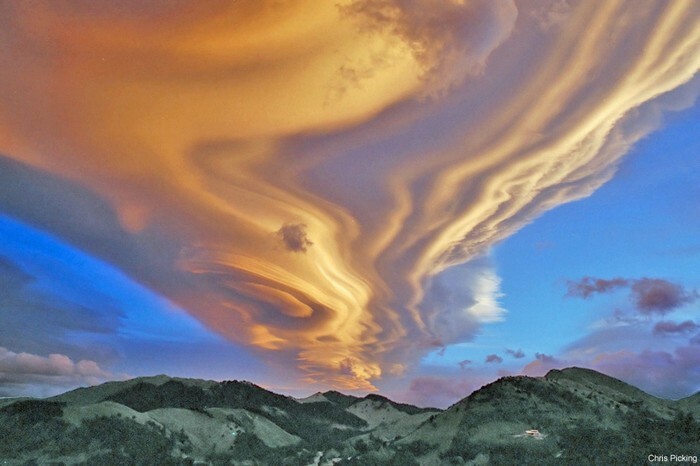 These clouds may produce precipitation, which is the primary route for water to return to the Earth's surface within the water cycle. Condensation is the opposite of evaporation. 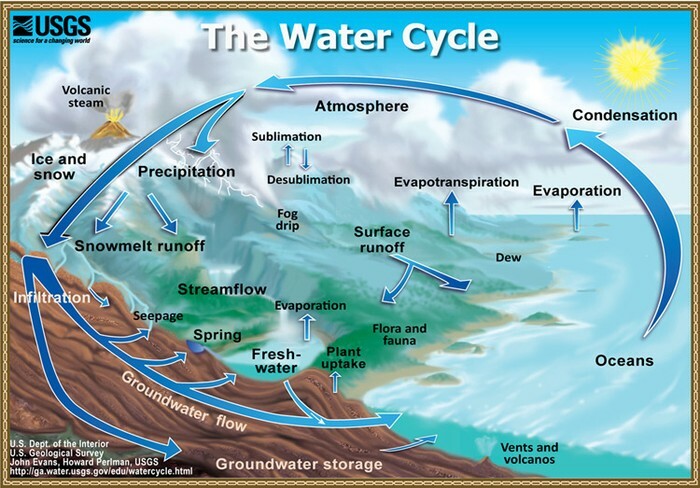 The water cycle is all about storing water and moving water on, in, and above the Earth. Although the atmosphere may not be a great storehouse of water, it is the superhighway used to move water around the globe. Evaporation and transpiration change liquid water into vapor, which ascends into the atmosphere due to rising air currents. Cooler temperatures aloft allow the vapor to condense into clouds and strong winds move the clouds around the world until the water falls as precipitation to replenish the earthbound parts of the water cycle. About 90 percent of water in the atmosphere is produced by evaporation from water bodies, while the other 10 percent comes from transpiration from plants.